There’s similar public opposition to U.S. spying on the respondent’s national leaders. Majorities in 34 countries find such action by Washington to be offensive. This sentiment is particularly strong in Germany, where the American government allegedly listened in on German Chancellor Angela Merkel’s cellphone conversations. But there are similarly overwhelming objections in Egypt, Jordan, Lebanon, Venezuela, Greece and Brazil. Publics around the world also generally oppose Washington’s surveillance of Americans. Majorities in 26 nations say it is wrong. But such opposition is less intense than criticism of U.S. spying on non-Americans, while majorities in the Philippines, Nigeria and Uganda actually back Uncle Sam’s electronic oversight of Americans. Spying on suspected terrorists is another matter. Majorities in 30 countries surveyed voice the view that electronic oversight of alleged terrorists is acceptable. Israelis, Italians and Kenyans are particularly supportive, as are roughly eight-in-ten Russians and Tunisians. Notably, Germans, who are particularly incensed about American spying on both Merkel and on ordinary German citizens, have few qualms about U.S. eavesdropping on alleged terrorists: 70 percent support such efforts. But U.S. spying has tarnished America’s image as a staunch defender of the personal freedoms of its own people, long one of the positive attributes of U.S. soft power. Admiration for America as a defender of such civil liberties has dropped significantly in 22 of 36 nations where there is comparable data for 2013 and 2014. NSA actions have particularly hurt the U.S. reputation in Brazil, where belief that Uncle Sam respects Americans’ freedoms is down 25 percentage points, and in Germany, where it is down 23 points. Drops of 20 points or more are also found in El Salvador, Pakistan, Argentina, Spain and Russia. Still, half or more of the public in 33 of 44 nations surveyed still think that Washington safeguards Americans’ freedoms. And the U.S. image as a protector of personal liberties remains quite strong in a number of Asian nations: South Korea, Philippines, Japan and Vietnam; and also in the Middle East, in Lebanon and Israel. NSA spying has also helped erode President Obama’s standing in some countries. A median of 56 percent in the 43 countries outside the United States have confidence in Obama to do the right thing in world affairs, largely unchanged from last year. But his image is down 17 percentage points in both Germany and Brazil, again the countries where Obama administration’s alleged spying on their leaders was a major domestic issue. But revelations of NSA snooping have had no appreciable effect on America’s overall standing in the world. A global median of 65 percent see the United States in a favorable light. And the global public’s judgment of the United States is largely unchanged from 2013. The biggest dip in the U.S. image is in Russia, where it is down 28 points since 2013. But that is likely to be largely driven by the confrontation over Ukraine. U.S. favorability is down 8 points in Brazil, which may be a casualty of the NSA spying. But 65 percent of Brazilians still hold the U.S. in high regard. 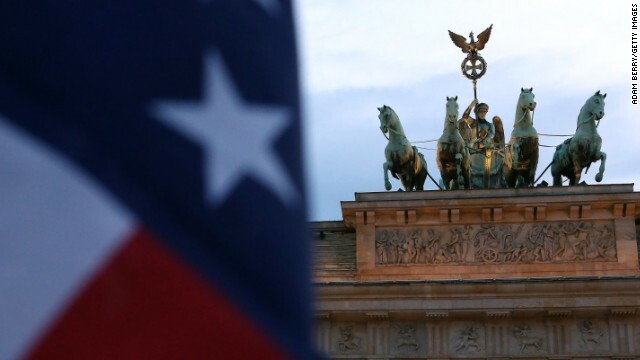 Only just over half of Germans see America in a positive light, down 13 points since 2009, but that decline began well before the NSA revelations, reflecting a more complex set of German emotions about the U.S. The efficacy and morality of NSA spying will be widely debated for years. It is clear that most publics around the world oppose it and that it has damaged America’s soft power image as a defender of personal freedom. But foreigners’ opinions about the United States are driven by numerous issues. And, to date, there is no evidence that widespread revulsion against NSA spying is fueling a new rise of anti-Americanism. « Previous entryWhat I'm reading: A Chinese Gold Standard? @ My Troll, "it's" is not a possessive form. Who cares what the world thinks as long as the American people are happy with totalitarianism, and as long as the NSA can blackmail foreign government into subservience. Very well put, JCDavis. Unfortunately, most Americans are willing to believe anything that comes out of Washington D.C. and that's why things are such a mess nowadays! It sure HAS sparked anti~americanism in this country!!!! @ chrissy is correct in that many USA citizens and residents are not pleased with NSA. However, I am entirely pleased to know that I am somewhat less likely to die in an exploded airliner or subway tunnel as a result of spying by my government. How naive it is to advocate spying on terrorists but not on persons who are not terrorists! The second sentence in my post above certainly should have been recast, but my intention is clear to any readers whom I did not offend in the Gaza thread. "However, I am entirely pleased to know that I am somewhat less likely to die in an exploded airliner or subway tunnel as a result of spying by my government." And if you can cite a single instance of such a plot that was foiled by NSA spying, then maybe I'll believe you. The NSA has been pretty much worthless when it comes to stopping terrorism. All this snooping around has harmed the US image abroad and angered US citizens with it's data collection program. How would you feel if your neighbor has been opening your mail without your consent for years? In the end, the NSA has caused more damage than it's worth. With nearly $50 billion of taxpayers money going to the NSA, perhaps it's time to just shut it down. Lol @ Joey i understood what you meant. Guess im not quite sure just how you couldve worded it differently though! And i would agree, if in fact, they were to actually thwart terrorist attacks! So far though that has NOT happened. NSA did NOT stop the Boston Marathon bombing nor 9/11. And since theyve been a dept of the DOD for over 50 years those 2 attacks shouldve been detected prior to actually happening, wouldnt you think? I mean hell the ppl working for NSA know if their significant other is cheating so the should know the bigger things going on right? I dont mind so much if they know my business so much cuz they would just be bored to tears! I DO mind that my tax dollars are paying for them to spy on their spouse!! @ chrissy, through spying, plots to construct bombs here in NYC residencies have been discovered and thwarted. If every plot is not discovered, that does not mean that the system is a total failure. And dont fret @ Joey, i havent read your post that youre referring to, but look at it this way. If you havent offended someone once today that you arent doing something right. Right? Lol. No matter how you slice it, what NSA did was totally wrong! Yea @ George...but what they DIDNT DO was even more wrong! Tosh.0 is cra# now and offends me put that guy in jail!! My point exactly @ ian! We are fast approaching the stage of the ultimate inversion: the stage where the government is free to do anything it pleases, where the citizens may act only by permission; which is the stage of the darkest periods of human history, the stage of rule by brute force. The only power the government has is to crack down on criminals. Well when there arent enough criminals, one makes them. One claims so many things to be a crime that it becomes impossible for men to live without breaking laws. @ chrissy: I don't understand your intention in the sentence, "the only power the government has is to crack down on criminals." Did you mean exactly what you wrote? Clearly, the government has more power. For example, the government can tax my income and "spread the wealth around" to others who cannot get, or cannot do, jobs. There are other possibilities for the government's entertainment, but that one, the Robin Hood Project, is enough for me to question your statement. In anticipation, let me assert to all readers here that it is not a crime for me to make more money than someone else does. Knowing that my opinion is not popular, I still think that the activities of the NSA have been good, and that they will continue to help the USA. Look at the stock market. Look at Chinese retaliation under the guise of anti-monopoly against Microsoft, Google, Qualcomm, Apple, etc. The NSA's actions have greatly harmed the US economy. What a terrible abuse of statistics. The only way the headline is true is if the world's people are the equivalent of single-issue voters. They've made it very clear that they resent the spying, and parts of our tech sector are taking a major beating as a result. If it hasn't made us pariahs worldwide, we're supposed to think no significant harm was done? Gimme a break! Well Mr Pew, as one who lives in Asia I can tell you are totally out of touch with reality. But then you are a pollster and that explains it. I am also pleased to hear the "folks" in Uganda, The Phillipines and Nigeria back America's surveillance of its own citizens. @ Joey, that was a quote by Ayn Rand. And it certainly does appear where the government is headed. And the NSA has been in existance for over 60 years and it has NOT protected the lives of many american citizens! If NSA has protected my life one time, then whatever NSA wants is fine with me. I would agree if they in fact had. But as i lost my sister to the biggest terrorist attack ever to this country im not inclined to look to favorably on this dept! Just take snooping activities on personal level: Nobody likes to be spied on, because everybody has his/her little secrets that he/she wants to keep for him/herself. On national level is the same. More importantly, there's the collective feeling of disappointment and anger, because it's the sovereignty of the nation that has been violated. What does freedom and peace mean to the average American, as we stand at the local line up at the Starbucks to order a soy chai coffee with our morning blueberry muffin before we head to the office for another day at the New York Stock exchange. To most of us why should we give a damn about freedom and liberty we live in the safest country in the world or do we? Freedom and justice are not just words that echoed by the US Airforce men and women but also the brave employees of the NSA who screen threw out daily email and telephone phone calls to protect us from the next terrorism attack which could happen in our quiet urban neighborhoods were our kids play and go to school. Like most Americans like myself we don't mind the NSA being the shadow listening to our phone calls, and going threw our private emails if helps to curb terrorism then I am all for it but then should be moderation when the NSA spy's on the average American household if they fit the bill of being a threat to our great nation. President George Bush once said Let's Roll America so as Americans we need to roll with the times that our great nation is always and will be under constant threat from new terrorist cell then we need new way's to combat them before they affect our daily living lives from new airport security measures or another terrorism color code for us to memorize. Without the NSA having a moderate control and listening to the private emails and telephone phone calls of the average American family, will our freedom and liberty be at risk from a radical terrorism cell from the Middle East which hates America and what we stand for years to come.